Upanishads are mankind's oldest works of philosophy, predating the earliest Greek philosophy. They are the concluding part of the Vedas, the ancient Indian sacred literature, and mark the culmination of a tradition of speculative thought first expressed in the Rig-Veda more than 4,000 years ago. Remarkable for their meditative depth, spirit of doubt and intellectual honesty, the Upanishads are concerned with the knowledge of the Brahman, the Ultimate Reality, and man's relationship with it. The name Upanishad is derived from the face-to-face mode of imparting knowledge - in the utmost sanctity and secrecy, to prevent its trivialisation or perversion. Composed in Sanskrit between 900 and 600 BC, the Upanishads presented here are by far the oldest and most important of those that exist. Max Muller’s classic translation of the first 12 Upanishads have been extensively revised by Suren Navlakha, who provides an entirely new translation of the 13th, the Kaushitaka Upanishad. 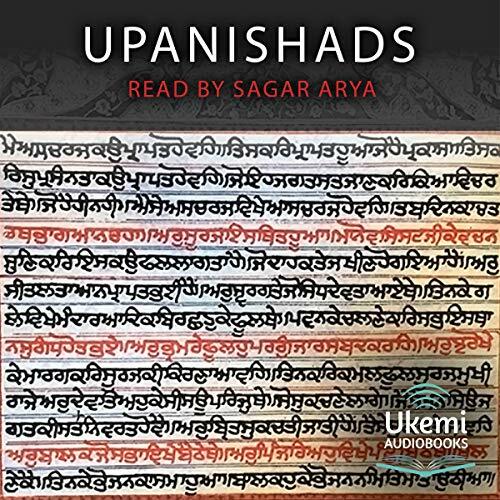 The recording opens with an extended and informative introduction to the Upanishads, setting the background to the genre, and each Upanishad is prefaced with a brief introductory passage. The Indian actor Sagar Arya gives an idiomatic reading. So beautifully read. I’ve been looking for an Audible like this for years! I absolutely love it. Chapter 23 was enlightening. I can’t say it enough. Absolutely wonderful! Very well read and a joy to listen to .